Sheet size of 8.5 x 11; page size should be slightly smaller since you are required to use bleeds; print on front page only. Should reflect real research on the topic you are providing information about. Research can be original or derivative (cited). Topic of the infographic may involve anything you are interested in and feel is appropriate for this project--running shoe design change, enrollment patterns in the writing major, demographics in Detroit, music sales among peer group, etc. Begin by thinking about the current event or social topics you are interested in, and then imagine what you'd like to know more about or teach others about. You must turn in a bibliography of works cited or used to inform the infographic. This should be uploaded as a second PDF document attached when turning in the primary infographic PDF. Graphics must include in-house graphics created in Fireworks, Photoshop, Excel, InDesign, etc. Should make use of color and print in color for final copy. Since bleeds are used, please print with crop marks and trim before turning in final copy. Turn in a PDF that shows crop marks (upload to site). Images, if used, need to be 200 dpi or higher for their given print size (I will check these in class in your original document). Every text element on the page should have a paragraph style associated with it. 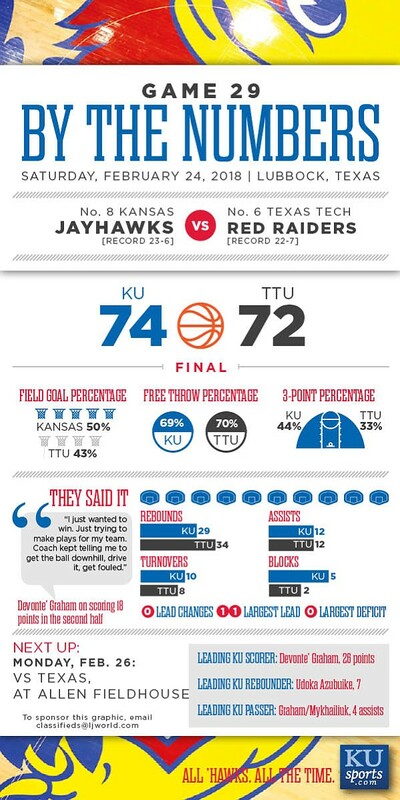 One kind of infographic from KU win last night.